Day 2 of WOO! This is the first full day and also the final day of the Undergraduate Research Program Directors – Windows of Opportunity conference. I’m still exhausted from the CUR Business Meeting, but I know there’s much to learn today that can strengthen the programming and opportunities for my students and campus, so that keeps me going. I started the morning by attending a session titled Growing a Community of Undergraduate Scholars to Strengthen Undergraduate Research Programs. For the purpose of the session, the speakers were defining a “community of scholars” (or COS) as: A group of students with similar/like-minded interests (from diverse fields) who want to help one another move forward academically and professionally. It is a group which values and encourages learning, and fosters identity development as researchers. I really like this idea of having a COS. I think it happens too often that a student researcher may be the only one working in a discipline or with one faculty member, and students learn so much from connecting with other students. A COS gives students a community they can identify themselves as a part of. Univ. of Washington has a COS they call the Undergraduate Research Leaders, and NIU has their Research Rookies program (students – you may want to read their student researcher blogs!). This model is something I want to establish at Penn State Brandywine, at least for my Earth and Mineral Science advisees. Since I only have freshmen and sophomores EMS students across 16 different EMS majors, many of them never take classes together, or worse yet(! ), never take a class with me. I want to provide my EMS students research experiences before they head to the Penn State University Park campus to finish their majors, and for them to be a part of a true community with an EMS identity at Brandywine. So what do you think EMS students – are you ready to be a Research Rookie?!? The next session I attended was titled Designing the University of Michigan UROP Research Scholars Curriculum: Expanding the Undergraduate Research Experience. I won’t say much about this session, since unfortunately I didn’t take away much from the presentation. The talk focused on listing what their program does, but not how and why, which are the parts I am most interested in learning about. That being said, it was nice to be reminded that any program with/for undergraduate researchers should start by defining the goals for the students (they are the top priority, not the faculty), and that students can be actively involved in the planning and facilitating. I also like this question the program gives to students as part of an exit survey at the end of the summer/semester research experience: If you could design a seminar for Research Scholars, what would it be? I’m curious what my own students feel they are not getting enough of in their own research training, and I would follow up the question with “why” they feel they needed this seminar. Students, I welcome any responses you want to send my way, no matter how long ago you did research with me! Then it was time for lunch with Sylvia Hurtado as our featured speaker. She spoke about Undergraduate Research Experiences Among Underrepresented Groups: A Story of Success. The takeaways I had from this talk include: (1) the need for early access for authentic research experiences; (2) faculty need to move from screening students to participate in undergraduate research experiences toward a talent development approach for all; and (3) have students develop ownership over the process and of the knowledge during the research experience by getting students out of the “plug and chug” mode. Her points are great one to spend time thinking about. I’m already on board with #1 and #3, but #2 will take some thought and thinking about how to effectively implement undergraduate research for all students, not just the ones I think are capable of doing the work. After lunch was the final set of oral presentations for the day. I chose to attend the session on Establishing an Undergraduate Research Center: Bottom Up, Top Down, Inside Out. I took two full pages of notes during this session! Although I will not be establishing a “center” of undergraduate research at Penn State Brandywine, I was hoping I would be able to get some tips that could be applied to starting up any new program students – and I was not disappointed. The two speakers presented questions to get the audience to think: What are the strategic initiatives on campus, and how do they support or align with research? Who is guiding the expansion efforts, and is there a target or benchmark? How will you assess the program to know it is working? The speakers also encouraged that a mission statement be created for the effort/program, as well as think about the short-term and the long-term goals. This session was very helpful in thinking about an Earth & Mineral Science program for students I would like to start up on campus – need to think about this more…. 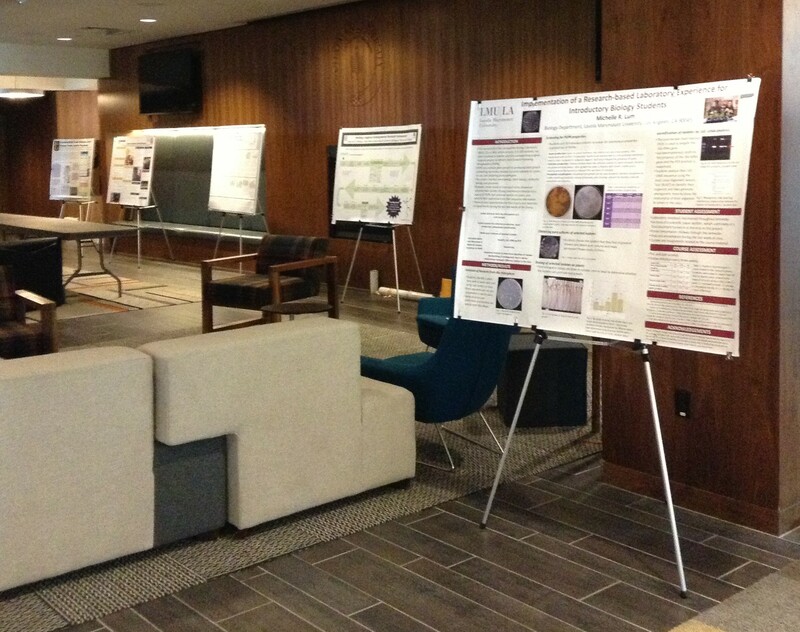 The last session of the conference was a poster session, with 41 posters grouped into categories of Administrative Nuts and Bolts; Broadening Participation in Undergraduate Research; Marketing, Fundraising & Public Relations; Curricular Innovations; and Assessment. I really enjoy poster sessions in general, as these sessions allow me to spend time going through the posters for as much time as I would like, and I can listen to and ask questions of the poster authors. There were definitely some interesting posters where I jotted down some notes for further exploration. One poster described the process the University of South Carolina went through to establish their undergraduate research journal, Caravel. The University of Michigan Library had a poster discussing some of the seminars they hold for undergraduate student researchers, such as how to do Academic Research with Google. The University of Kansas had a great poster describing their programming in the KU Center for Undergraduate Research. I learned about Berkeley’s NERDS program and their Dream Map exercise for students to plan their future, and who knew that another university has a EURECA program! At Penn State Brandywine, EURECA (Exhibition of Undergraduate Research Enterprise and Creative Accomplishment) is the name of our undergraduate research symposium. Apparently, The American University in Cairo also calls their annual undergraduate research conference EURECA (Excellence in Undergraduate Research, Entrepreneurship and Creative Achievement). I am saturated with new information, innovative ideas, and stronger connections with colleagues across the country that share the same passion for mentoring undergraduate student researchers as I do. I guess it is now time to head back home… until my next conference! Thank you CUR and Chapman University (special shout-out to Chris Kim as the local organizer) for a great meeting and conference. I look forward to working with others to even further advance undergraduate research opportunities and experiences!